Find hotel near Eglise Saint Jacques Sur ..
On July 21, 1831, Leopold I took the oath of allegiance to the Belgian Constitution, and became King of Belgium. 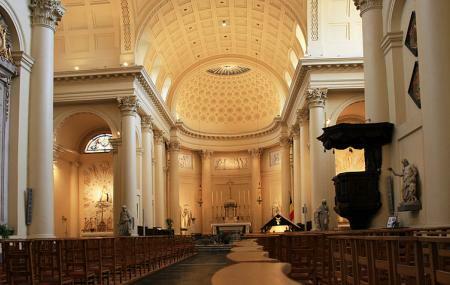 He took that oath in this grand neoclassical church built in the 18th century. The facade however is almost entirely Greco-Roman, with its huge triangular pediment and great Corinthian columns. Moses and King David’s statues guard the entrance. The interior is relatively stark, and only the dome is decorated with floral motifs. You’ll find two paintings by Jean-François Portaels, The Crucifixion and The Cross, at the ends of the transept. Contact the l'Animation Chrétienne et Tourisme for possible guided tours of the church. Check church website for various service times. Imposing building next to the courthouse. The interior is a bit bland, nothing breathtaking or special. The proximity to the museum of fine arts and the palace gardens make it worthwhile. Very beautiful Church which is known as the chapel of the king situated next to the Royal palace of Belgium king in Brussels. Again very beautiful church, thank God! Saint Jacques-sur-Coudenberg is a neo-classical church at the Grand Palace in Brussels. The church was built in the 1730s and features a nice columned portico, tiled pediment and dome. There is a impressive equestrian statue in front of the church as well. The church is basically across the street from the Royal Museums of Fine Arts and can be seen before or after your visit to the museum complex. This church is tall, peaceful and quiet. It is close to Brussels park. Don't miss it. It looks like you can not come in but is is open. Come and cool down before heading to the palace or the park. Enjoy!